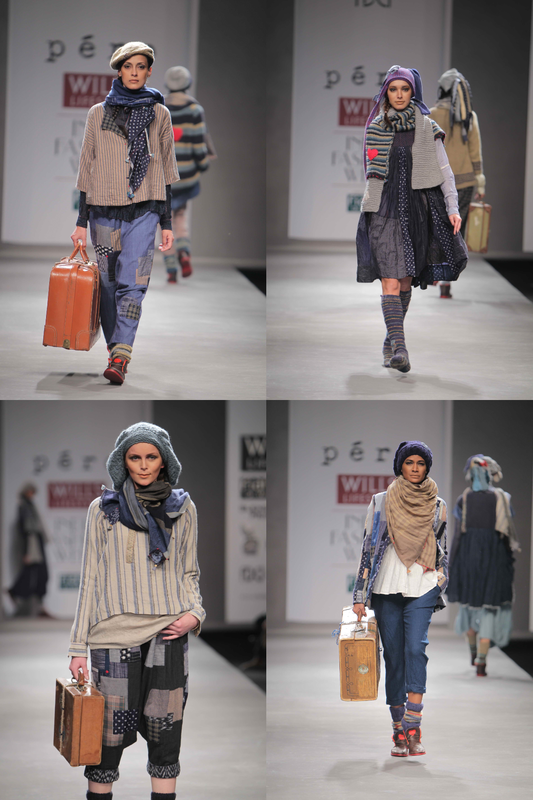 Pero by Aneeth Arora– a patchwork of fabrics from India – Khadis from West Bengal, Ikats from Andhra Pradesh, Pashminas from Kashmir and woven wool from Kumaon. Love her aesthetic. 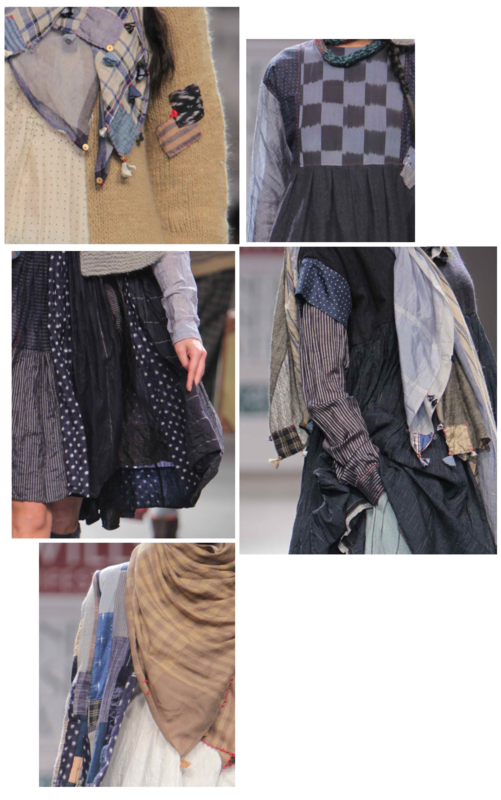 This collection reminded me of Boro – mended and patched Indigo cotton rags worn by Japanese peasants. The little red heart pops up here and there and make the blues cheery. Vineet Bahl’s Caravan – He brings together Vintage Romanian shawls & antique Sardinian embroidery to celebrate the world traveller. 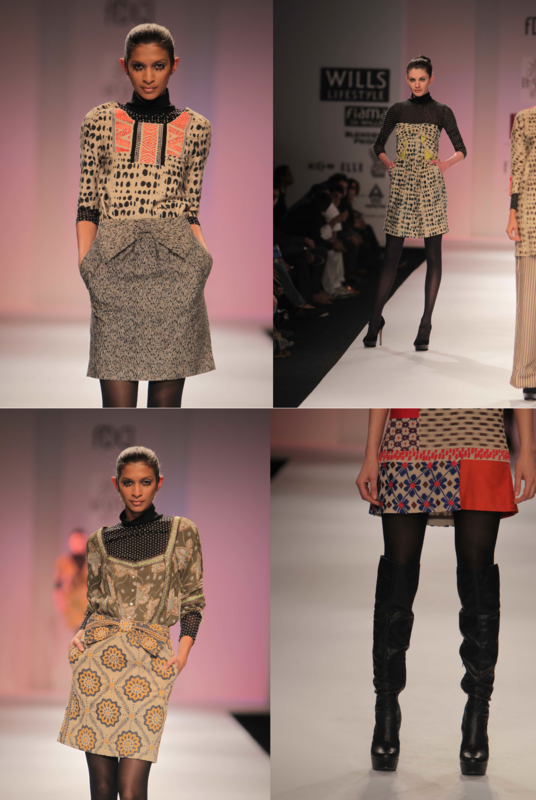 Featured are neon accents on Kantha and intricate stone work done on brocade. It was a beautiful collection. I received only a few pictures of this, there is more that I saw on Vogue.in, and they are certainly worth surfing for. 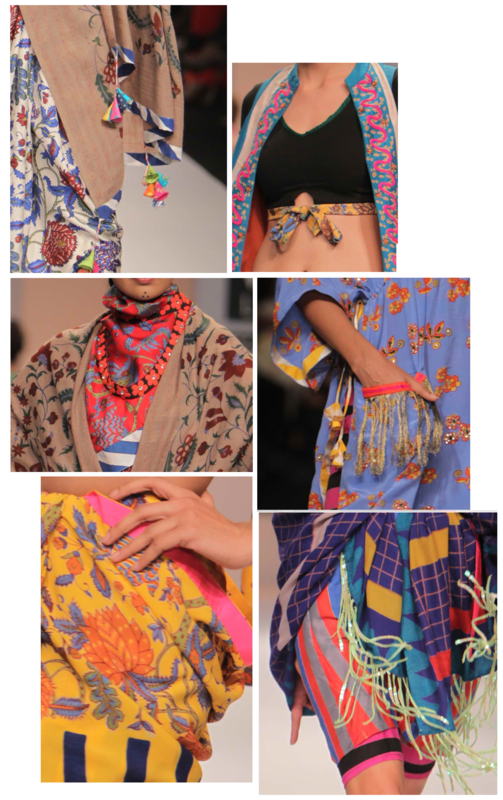 The prints,the embroidery, the kantha work – it tells a subtle yet rich winter story. Vaishali S presented Khawaja, a divine term associated with Sufi saints. She was ‘fascinated by the true and pure spirit of denying of being and becoming nobody’. Thus hand woven cotton fabric is used to denote purity and embellishments are used to represent the thought within the garment. Black and white has been used to show two sides of the world. The drape and the flow allow for movement and dance. She has structured her inspiration and created definable silhouettes within all that fabric and flow, while keeping it understated. The red as usual adds drama to the black and white world. 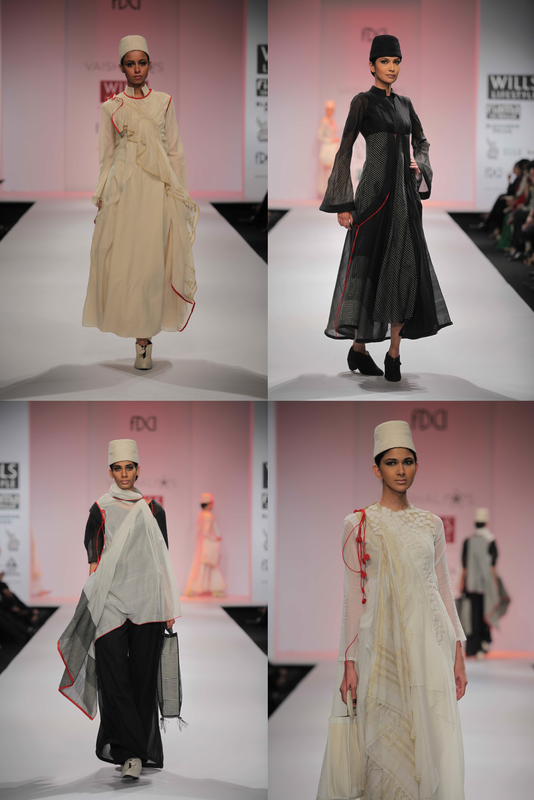 Anju Modi draws inspirations from the regions of Uzbekistan, Afghanistan & Pakistan touching the Kutch border in India. Love the mix of wool, silk and cotton – it has weight and texture, yet flows freely. Becoming Kami – Anand Kabra delves into purification rituals and derives inspiration from Misogiharai, a Japanese Shinto ritual where running water is used to bathe the body to purify body and soul to realise the divine power that rests in all living beings (Kami). His motifs are water-dwellers like rippling reeds, the Lotus leaf and the Lotus (a symbol of purity). He uses heavy cottons, silk slubs, organza, crepe de chine, Chiffon, coated wool and Angora blends with Zardozi cutwork and dori work to tell the story. The heavy fabrics bring austerity to floaty chiffons, everywhere it seems the light is balanced by the heavy – there is freedom but much control. 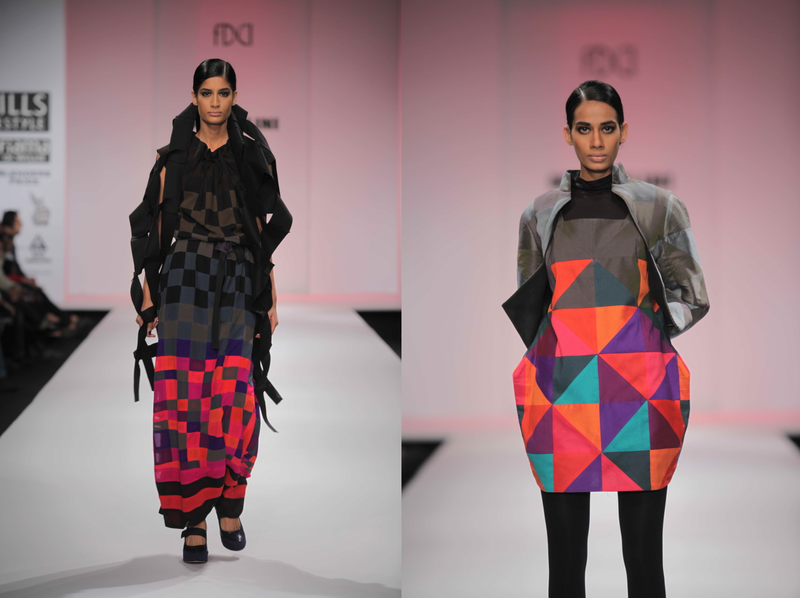 Mrinalini – love the colours, the geometric quilt and pixel like patterns, all held in with black and grey. 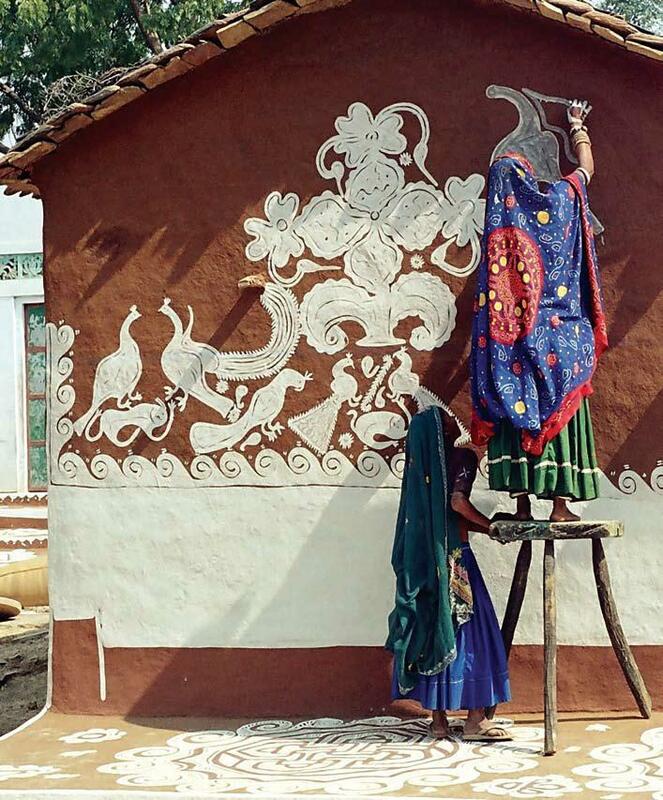 James Ferreira – it was lovely seeing Bandhani used like – dramatic, big and bold on colours that popped. Loved the Gujarati shawl-like woven fabric dress. 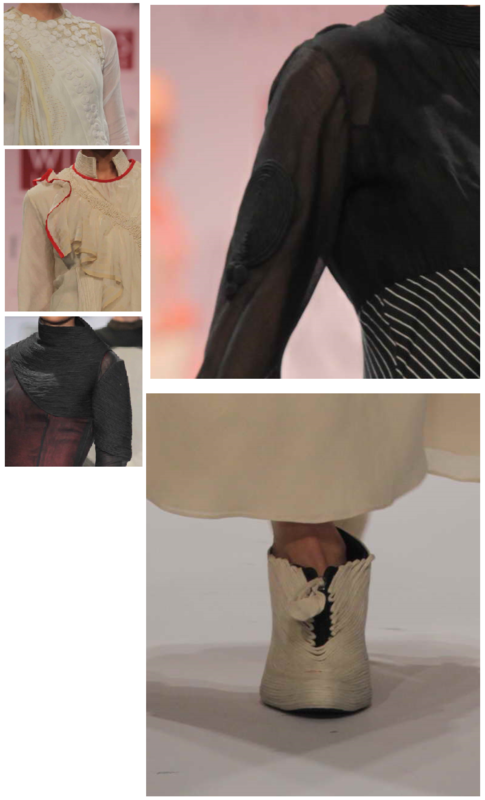 Aakaro – Hand woven stainless steel, Swarovski crystals, Mohair, Jacquard – Gaurav Jai Gupta’s garments are intriguing for what goes into them. 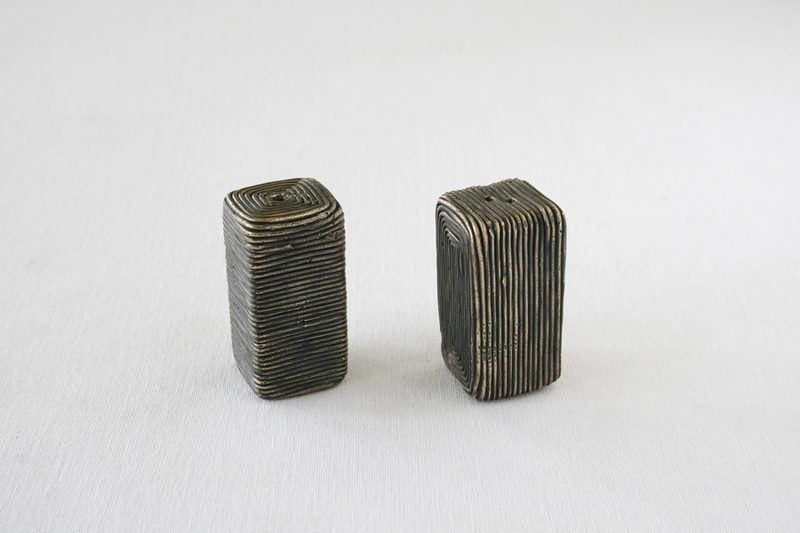 Yet the use is restrained, it doesn’t seek to make a statement but is used in a meaningful way. Liked the way his garments shaped the body in these. Junkyard by Anand Bhushan – Scrap parts, rusted metal and micro components of machinery are pieced together to create this collection. What’s also remarkable is that various forms of weathering – rusting, tarnishing and oxidation form the tones for it. 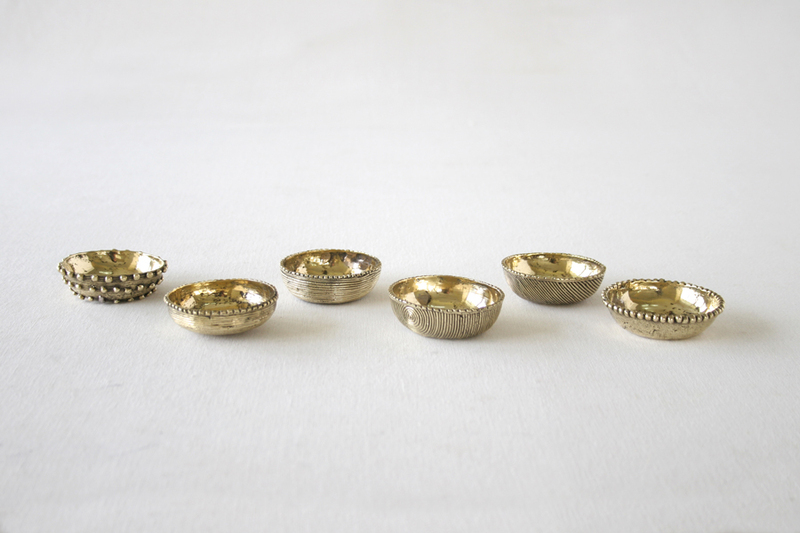 It’s crafted very well to make the metals mould the body as easily as fabric. It is tech, yet not the usual futuristic and alien take on it. Surat n Spice by Anupama Dayal takes inspiration from the “insane colours of the native crafts” and adds a sporty side to it – there are cycling shorts under tunics, striped borders mixed with floral prints, pockets to keep ones hands warm and layers that can be added or taken off as the weather demands. Raakh – the remnants of things when they are burnt. 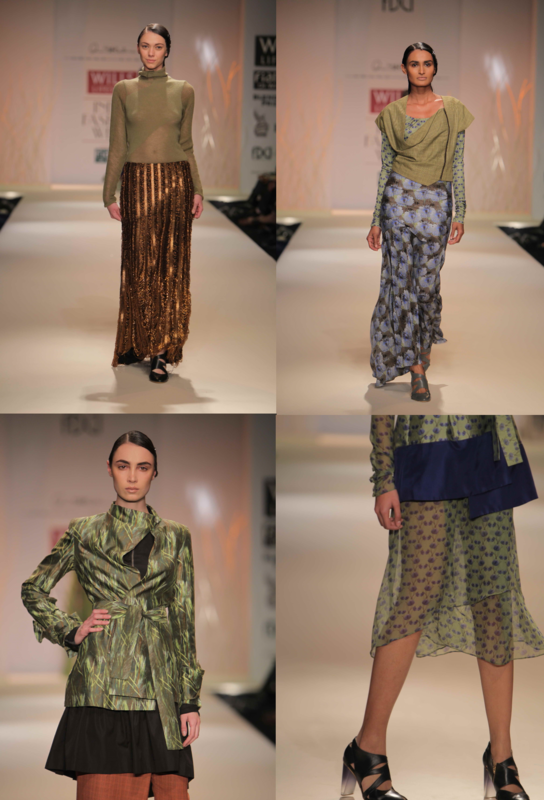 That formed the basis of Jyoti Sharma’s collection. Ash grey and black tempered with red and rust. It reminded me more of volcanic rocks, how they form holes within as the lava within them cools. 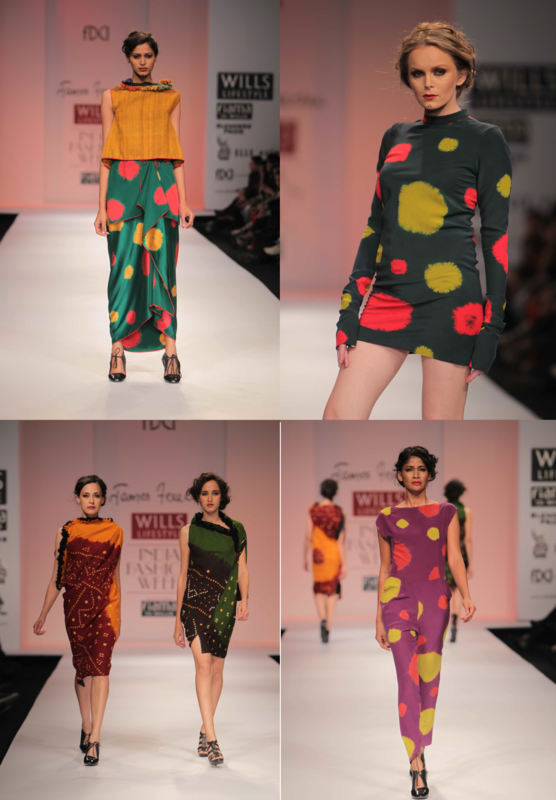 Dev R Nil presented My Alice in Wonderland – a merging of the real and the fanciful – fishes and butterflies mingle in a spread of graphic kantha, batik, silkscreen printing and personalised weaves. I loved all that I saw. 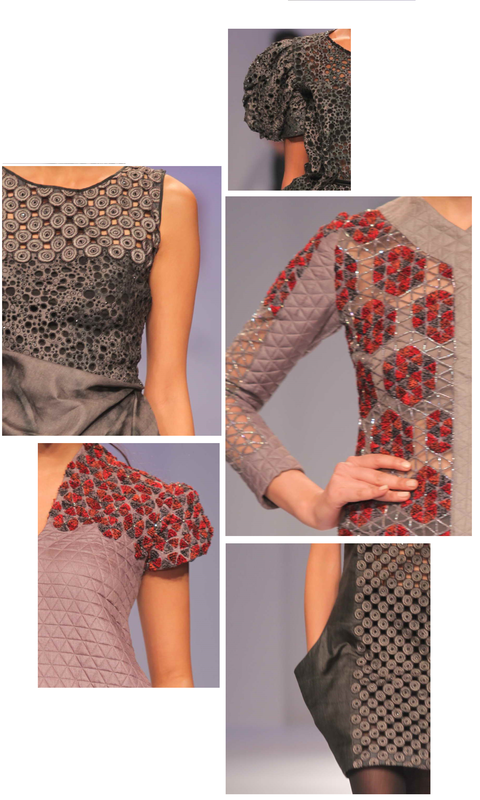 Rahul Mishra’s collection played with lines and curves to create patterns on sheer and solid fabrics. The colours were dusty and muted but the silk organza made them seem radiant. Awesome collections! Really Very beautiful all collections are very nice. Also thanks Anand Bhushan such a great designs. Last time i have bought some collection by Anupama Dayal. Its very comfortable and fabulous. Thanks for sharing beautiful design and content. 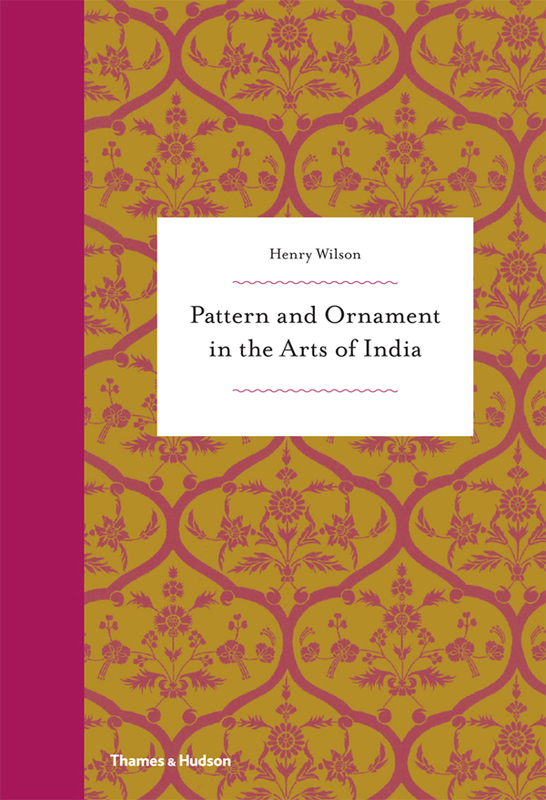 Very interesting insights of the various collections. Every time I come to Indian by Design, I learn something new . Thank you Purvi. Glad that you feel so.